This time of year is always packed with tremendous educational and social opportunities. 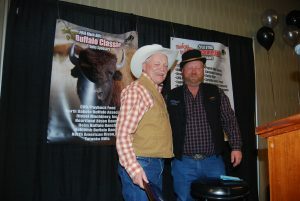 Starting with the Legends of the Fall in Minnesota, the State and Regional meetings begin to flourish in frenzy of bison festivities. Later this month will be the coup de gras at the National Bison Association Winter Conference in Denver, the largest yearly gathering of bison producers in the US. With all these opportunities why attend the DTBA Conference only a week after the national conference? What benefits will you get here that you wont in Denver? Come and catch up with friends and discuss you operations. First and foremost, not everyone is a member of the NBA, for better or worse. This means the DTBA will attract different producers for you to discuss weather, prices, ideas, stories, future plans, past successes, partnerships, and anything else you can imagine. It is also a time for you to get to know and help new producers that may not have the resources to get the Denver. The DTBA membership is what makes it special, getting to see the familiar faces and meet the new is what makes the Winter Conference special for South Dakota. The final event of the weekend is also the most important for our producers. The Guns and Girlz are ready for sale. According to everyone that has seen these animals, this is the best class of bulls and heifers that we have ever had come through this performance sale. The 25 bulls that are making it to auction are deep in quality, with even low placing animals having the quality that can help your ranch. The heifers are also shaping up to have some high quality throughout the class. 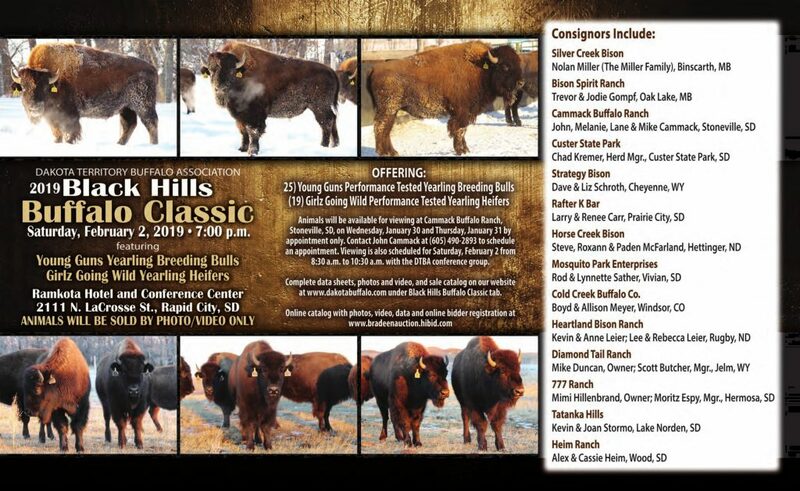 Come and support our consignors… And pick up a ranch changing bull and heifer along the way. This year we will have some tremendous local speakers discussing a wide variety of topics. After the business meeting on Friday, be ready for a tremendous panel of bison processors discussing the issues surrounding bison and buffalo labelling. This panel will include NBA’s Dave Carter, DTBA’s outgoing Vice President Boyd Meyer, Rapid City’s own Bruce Anderson, and Rocky Mountain Natural Meat’s owner and operator Bob Dineen. Saturday will also bring great value to our members. Dr Kayla Brown, hailing from Hot Springs, will be discussing necropsy technique. South Dakota State Vetrinarian, Dr Dustin Oedekovan will be discussing the happenings of state-wide animal health and bison health concerns and issues. Dave Fields from Bayer will talk about vaccines and how effective they can be and how to properly administer them. If you decide to stay in town instead of going to Cammacks to view the Gunz and Girlz, Tobie Brusseau will educate us on social media marketing and Tate Lantz from Rapid City’s NRCS Field Office will discuss opportunities open to bison producers with the new Farm Bill. What will be available this year at the auctions is always a fun mystery. A few known items include raffle tickets to the Scholarship Committee Gun Raffle (which will be raffled off at the end of the conference), ten bags of Redmond Mineral, and, of course, the membership favorite, the travelling prairie dog exhibit. Come with fun items to donate for auction. Remember all proceeds go to the DTBA and help fund our many services and events. To register for the Winter Conference, please go here. For more information please contact us at the DTBA here.